For the second time this season, the Green Bay Packers and the Seattle Seahawks play each other. The stakes are much higher this time, playing for the NFC title and the opportunity to play in the Super Bowl. The Seahawks (beating the Packers 36-16 in their week 1 encounter) are trying to become the first team in 10 years to make it back to a Super Bowl, the first since the New England Patriots in the 2004 season. The Packers have been knocked out by an NFC West team and specifically being the San Francisco 49ers over the last two years: The first time (after the 2012 season) was Colin Kaepernick blowing by them and a year later was the Packers messing up at home against the same 49ers. As good as Russell Wilson is, it seems that the key to the Seahawks succeeding is always Marshawn Lynch, who rushed for 1306 yards during the regular season but wasn’t as useful in the win over the Panthers, rushing for just 59 yards. Wilson threw three touchdown passes in the win ans the Seahawks defense did most of the work. That seems to be the overall plan: As long as the offense doesn’t turn the ball over and Wilson gets adequate protection, the defense will take care of the rest. The Seahawks have lost only twice over the last two seasons at home: To the Dallas Cowboys this season and the Cardinals in 2013. The Packers are trying to figure out what worked for them both and try to emulate that, because their attempt in week 1 didn’t turn up so well, losing by 20 points. So what did the Cowboys and Cardinals do so well? Firstly, it’s make Wilson look bad. Both of those losses were Wilson’s worst games since becoming the starting quarterback for the Seahawks, including his two lowest QBR’s, their two shortest drive distance averages in the Wilson era and the lowest number of first downs achieved by the Seahawks with Wilson at quarterback. All that is achieved with a very good pass rush and defense, but it has to come with running the ball. The Seahawks have allowed only 3.4 yards per rush this season, the second best run defense in the NFL. In their losses this season (four of them) they’ve given up 4.3 yards per rush, 138.8 yards per game and 32.5 carries per game. While Aaron Rodgers is obviously and always will be the main player on the Packers’ offense, it’ll be the team’s ability to run the ball and control the clock that will determine if this encounter will go down as much better for them. Injury or not, the Packers are underdogs in this one. How can they be anything else considering the team’s previous meeting this season and the way the Seahawks manhandles their opponents in the second half of the season. They’ve won seven in a row and in the final six regular season games this season gave up only 6.5 points per contest, while outscoring opponents 45-0 in the fourth quarter. They looked dominant enough in their 31-17 win over the Panthers, who usually make things a bit more difficult for them. 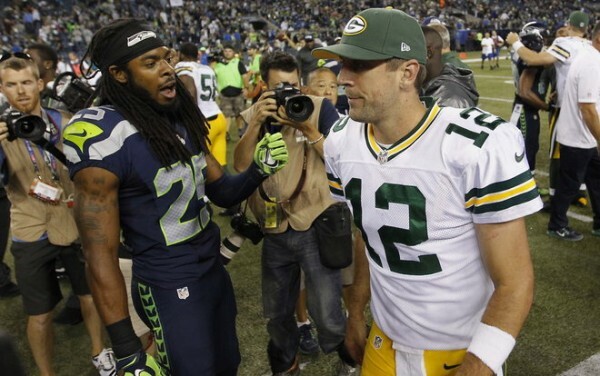 The Packers can’t let the Seahawks bully them right from the start. Falling behind against the Seahawks and trying to win your way back with deep passes against a still excellent secondary is a recipe for disaster. Running early and often and succeeding with those runs will pave the way to a much more even contest which will also give the Packers an opportunity to influence with their defense. Eddie Lacy ran for just 34 yards on 12 attempts in that loss, but has been doing a lot better in the second half of the season, including 101 yards in the win over the Cowboys. That’s the kind of performance if not more the Packers need from him in order to have a shot in the toughest stadium in the NFL.